I don’t know if you’ve heard the latest but…COTTON ON is coming to the Philippines! OH YEAH! For those of you who are not familiar with the brand (WHYYYYYYY!! ), COTTON ON is one of the best brands that offer a wide range of fast and trendy fashion in the most affordable prices. Whenever I go abroad, it’s one of the stores I MUST visit to get my much needed fashion fix. Now, I don’t have to go out of the country to shop at COTTON ON. The great people behind Suyen Corp/Bench is bringing the awesome Aussie brand to Manila. Finally!!! In fact, the first COTTON ON branch in the Philippines is already opening this September 7 at SM Mall of Asia! And to celebrate this grand opening, COTTON ON is presenting its first ever fashion show in Manila at a by-invitation only brand launch and press event on September 6 at SM Mall of Asia. YOU CAN BE A PART OF THIS! 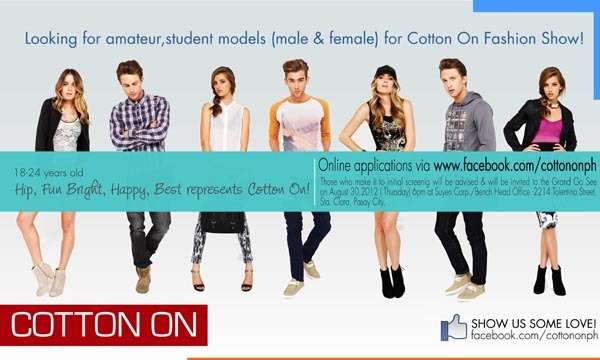 If you are 18 to 24 years old, fun, young, hip and bright–basically someone who best represents COTTON ON, be one of the models at the COTTON ON fashion show by sending in your photo with your name, birthday and contact number through a direct message to COTTON ON Philippines’ Facebook page. You can also nominate your friend if you want to! Deadline for entries is on Aug. 29, 2012 at 12:00 noon. If you’re one of the lucky boys and girls who are shortlisted after this initial screening, you will be advised via the COTTON ON Philippines’ Facebook page to go to the grand go-see happening this August 30 (Thursday), starting 6PM at the Suyen Corp/Bench Head office in Pasay City. This will be the final screening/auditions for the models. I will be there as well to help out with the final selection process so we may just see each other! Good luck to all the model applicants! Follow Cotton On Philippines on Twitter for more updates! YAY cotton on!! Did you choose any plus size models? I love Cotton On. I just hope they will also open a branch in Cebu. It’s fun to see new and fresh faces hehe. what if we’re from the province (i.e. Cebu/Davao)? Thanks lauren! But I’m already one of the judges for this haha! None stated :) You should try out! OMG Miss Camille! I just bit my tongue and did it! I sent an entry! (I heard there wasn’t a height requirement, is it true?? I hope it is…) I hope I do get in… I hope I’ll be able to meet you in person, you’re my fashion hero. hihi. Just a random question.. Do you know how to speak chinese? OMG! Been waiting for this! Is the moa branch the first to open among the other branches? I’m soooo happy to be 18! Haha. we have them here everywhere. :P yes I do agree that their clothes are really affordable. Can models from overseas apply? I have a friend who models in Hong Kong and China. Would Cotton On reimburse models for their travel expenses? a relative from Australia brought us Cotton On blouses months ago. it’s nice to finally have them in our country. On a completely different note, you say you eat a lot…. I just wonder how you keep your belly/tummy in shape? I really like Cotton On!! I wanna join but I’m only 14. :( May be next time, haha! I’m not familiar with this brand, but will definitely be checking them out! I love Cotton On, Rubi and Typo!